My name is Pat Hale. I have lived in Southern California my entire life. I grew up in Whittier, which is located inland from here. I have two sons and three grandchildren who are very important to me. I wished they lived closer but they love the desert life. I have been helping buyers and sellers since 1979 and moved to Seal Beach in 1997. I love working in a town that feels as though it has been lost in time. I am never leaving this area. After working for larger real estate firms were you never really new anyone’s name. I decided to opened my own small boutique office in Seal Beach in 2006. 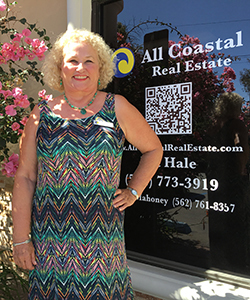 My Office All Coastal Real Estate and is a small office located at 132 1/4 Main Street, in Seal Beach. When you are ready to buy, sell or rent real estate come by and see me. Do you have what it takes to join our team? Tell us a little about yourself and attach your resume below!